University of Hawaii football coach June Jones has yet to decide on his future: to stay with the Warriors or sign on with Southern Methodist University's Mustangs. 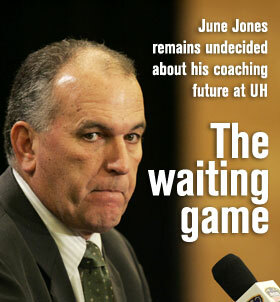 University officials were urged to redouble efforts to get Coach Jones to stay. The equipment will be used to fix damage from last month's storms and floods. The developer for a new recreational complex has revised their pitch to build 180 vacation "cabins." Leon Truong, a Hawaii man, was released after being arrested in Vietnam. The new year begins with a showcase of our staff photographers' favorites from last year. Chopra sealed Stricker's fate with a tap-in birdie to win the $5.5 million Mercedes-Benz Championship. William "Willie" Auld skippers the Mary Catherine, a tugboat that tows interisland barges. Hawaii Democrats will meet on Feb. 19, two weeks after 25 states will have chosen the nominee in primary elections or caucuses. A federal judge has issued a ruling that restricts the Navy's mid-frequency sonar off Southern California's coast.